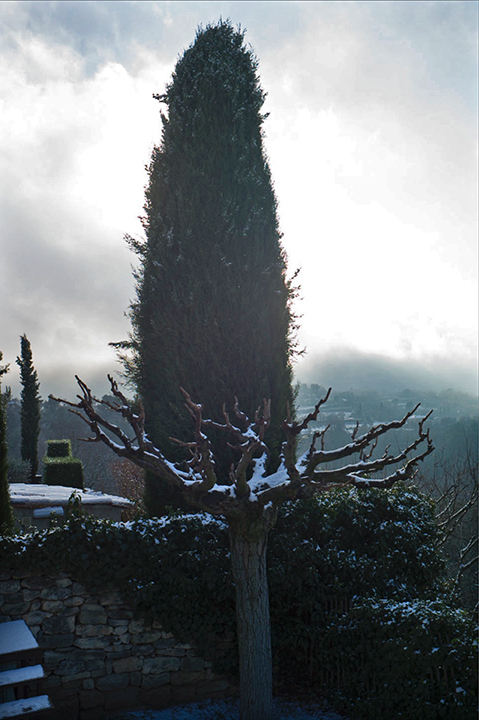 We woke up to a snowfall in the Luberon valley. The first thing I saw when I stepped outside was the uplifted, snow dusted hand of the tree, and the towering form of the cypress, behind which was the swirl of weather over the nearby hills. But what caught my eye, almost equally, was the green rimmed rectangle between the trees and the hills. Something of small note surely, but it pinged my eye in such a way as to ask for my attention. And when attention is called I always feel a sense of certainty, as if the tiniest note was the necessary ligature between all things, no matter how small a part it plays. Because, really, I am responsible for everything in the frame, and if that is a given, then I must validate it by seeing everything there is to see, and knowing that opens up my mind (the mind’s eye) which makes me more alert to seeing what else there may be nearby. This process of cumulative engagement is what I find so thrilling about the act of making photographs. It is ongoing and ever stimulating. One never knows what is coming next. This entry was posted in Uncategorized on January 15, 2015 by joelmeyerowitz2014.